Have a fishmonger remove the branzino’s spine and ribs, to make the fish more malleable and prevent bones from sneaking into the rice. When they come in contact with the bottom of the pot at the correct heat, the pair of whole fish in this dish will form a crispy skin amid the tahdig and infuse the surrounding rice with extra flavor. A medium fish, such as branzino, works well because its size allows the flesh within to stay moist and flaky while the skin caramelizes and crisps. Nestle two whole fish into a pot of herbed saffron rice to make this striking dish, a Persian New Year essential. Parboil the rice by following steps 1 and 2 of the Steamed Saffron Rice with Tahdig recipe. Set aside the rice to drain at room temperature as you prepare the dish’s other components. In a small bowl, add the ground saffron and ¼ cup of hot water. Set aside. In a medium bowl, combine all but 1 tablespoon of the fresh dill with all of the cilantro, parsley, chives, and dried dill and fenugreek, if using. Set aside 2 cups of plain cooked rice. Add the remaining rice to the herb mixture and fold them together gently with your hands, taking care not break the rice grains. Taste the mixture and season it with more kosher salt, if desired. Set the mixture aside. Season both fish inside and out with the ¼ cup olive oil and a generous amount of salt and black pepper. Stuff the cavities with the lemon zest, garlic, and reserved fresh dill, then drizzle each with 1 teaspoon fresh lemon juice. Close the cut sides of the fish back up, and set them near the stove. In a 10- to 12-inch nonstick pot set over medium-high heat, melt ¼ cup clarified butter with 3 tablespoons of olive oil and 1 tablespoon of the saffron water. When the mixture is sizzling, add the fish. (The fish should sizzle audibly as soon as it hits the hot fat.) Fry undisturbed until the skin on one side starts to crisp, about 5 minutes. Separate the fish to opposite sides of the pan, and quickly scatter the plain reserved white rice over the fish, gently patting the rice down around the sides. Cover the fish and the plain rice with the herbed rice (this will prevent the herbs from burning against the bottom of the pan). With the handle of a wooden spoon, poke a few holes in the rice, without hitting the fish-tahdig layer. Cover the pot and continue cooking on medium-high heat until the tahdig is set, 8–10 minutes. Meanwhile, in a small pot, melt the remaining 2 tablespoons of clarified butter and add it to the remaining saffron water. Lift the lid from the rice pot, taking care not to drip the condensation trapped under the lid back into the rice mixture. Drizzle the butter-­saffron mixture all over the rice. Wrap the lid in a kitchen towel or a couple of layers of paper towels to catch the condensation. (Make sure that the kitchen towel or paper towels are secured on top so that they don’t catch fire on the stove.) Place the lid back onto the pot, turn the heat down to medium, and cook until steam begins to escape from the sides of the pot, about 10 minutes. 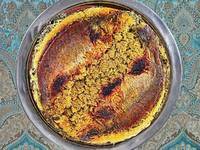 Turn down the heat to medium-low and continue cooking, rotating the pot a few times for even crisping of the tahdig, until the rice is tender and fluffy, the fish is cooked through, and the tahdig is crispy and golden, 30–35 minutes. To help release the tahdig, fill the sink with about 1 inch of cold water, and dip the bottom of the rice pot in the water briefly. (Alternatively, you can wet a kitchen towel with cold water and set the pot on top of the wet towel.) Place an appropriately sized flat dish over the pot (this will be your serving dish). Take a deep breath, and quickly and confidently flip the pot over to unmold the rice and tahdig. You should hear a swish when the tahdig releases. Carefully remove the pot, and serve immediately.